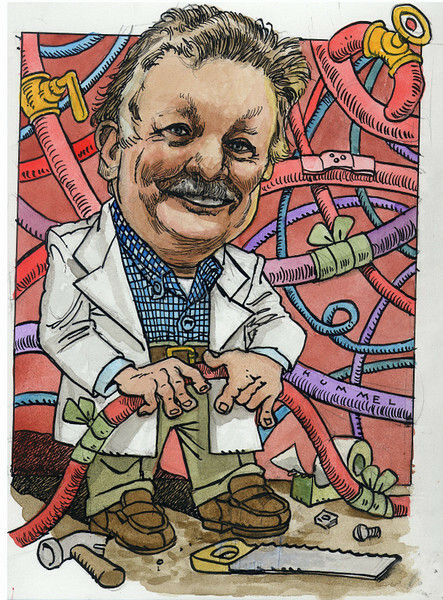 Although photography is a long time interest, in real life I am a Vascular Surgeon, as pictured here by my friend, Jim Humel, who kindly created this caricature for me. A lot of people think of a "Pro" photographer as a person who makes his living doing photography. Certainly, that would be one definition. My own concept is that a "Pro" photographer uses experience and skill to produce exceptional images for the love of it, for the shear joy of having made a wonderful image that others can enjoy, an image that expresses a fleeting moment, hard to repeat. Sometimes people comment "...you must have used a wonderful/expensive/unique camera." Cameras don't take pictures, however, people do. In reality, great images come via some combination of a thorough understanding of the physics involved and artistic ability; they have relatively little to do with the specific equipment employed. If you have questions about the photographs or wish to purchase an image, kindly send an e-mail to richard@starrettimages.com. I will respond promptly. All the images on this web site are copyrighted and may not be reproduced without written permission.